Conservatories are a wonderful addition to any home and an investment to be proud of. A light and airy extra room, where you can enjoy your garden come rain or shine. But, once the algae and lichen take hold on the roof, it is no longer as bright as it once was – and if this is not cleaned off, it can lead to permanent staining and discolouration. 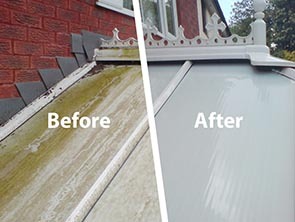 Whilst most of our customers prefer to have their conservatories cleaned regularly, we also offer a deep clean and conservatory restoration service for those “first cleans” or “just moved in”situations where a standard clean just isn’t enough! Using specialist detergents and our high-tech pure water cleaning system we can remove even the toughest grime, lichen, algae and dirt – starting at the top of the finials and working right down to the base panels. 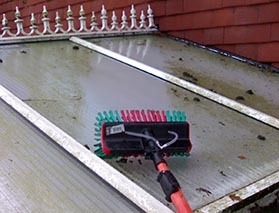 We can clean glass roof panels and polycarbonate panels with ease – using our pole cleaning system to minimise ladder use. The dirt might be tough, but our cleaning methods aren’t! 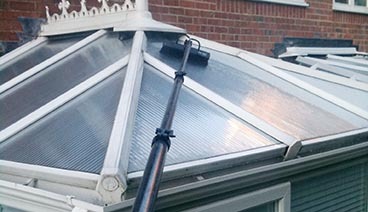 We take care of your conservatory using soft, non-abrasive brushes, detergents specially designed for the job, and purified water to rinse it down and polish it up to a shine. We’ve seen the damage caused by cowboy cleaners using pressure washers and abrasive scrubbing pads, and we’ve heard many stories about expensive repair bills. We have the experience and the know how to do the job right, and we carry full public liability insurance for that extra peace of mind too. If you’d like to find out more about the way we can revive your conservatory, call us on 0117 9566962 today!